While smiling at a little girl sitting in front of her at the girl's home in Northwest China's Xinjiang Uyghur Autonomous Region, a female cadre pointed to a printed paper card with the English word, "monster." 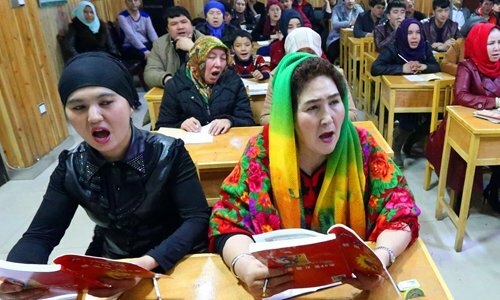 This was an English-language study session, and it was part of what Xinjiang government cadres and employees did during a recent "unity week," living together with grass-roots families from different ethnic groups. In December of 2017, officials and government employees at various levels in Xinjiang were required to live, eat and study with a local family whom officials are now under directive to consider and treat as "relatives." The unity week campaign, launched in December by the Xinjiang government to enhance ethnic unity and practice the spirit of the 19th National Congress of the Communist Party of China (CPC), has witnessed over one million government staff living together with their "relatives," the Xinjiang Daily reported. The move is a follow-up to the ethnic unity campaign launched by the Xinjiang government in 2016, during which government staff were first paired with local villagers, the Xinhua News Agency reported. A series of ethnic unity activities over the past two years has not only deepened mutual understanding and feelings between governments and grass-roots villagers of ethnic groups, but more importantly, as a soft policy approach, greatly contributed to the long-term stability of the northwestern region which observers said had been plagued by sabotage activities of the "three evil forces" of separatism, extremism and terrorism, observers said. Grassroots people from different ethnic groups felt the warmth of the Party and governments through ethnic unity activities. They resolutely expressed their determination to oppose the three evil forces, safeguard ethnic unity and national unity and stick to the belief of listening to and following the Party, according to the united front work department of Xinjiang. The English "monster" learning was caught on camera; a photo was published on the official "Ethnic Unity" WeChat account run by the united front work department of Xinjiang. The account, launched on January 1, shows how government staff strengthened ideological guidance to grassroots villagers through stories during the ethnic unity campaign, including the unity week. Government departments, institutions and media outlets across Xinjiang in recent weeks have been intensively publishing and reporting various stories and government employee diaries about unity week. In one such diary shared on the WeChat account of "Ethnic Unity," an employee with Xinjiang's discipline inspection agency wrote that their "relative" in Suluk village of Akto county, Memet Emet, cleaned the rooms and set up a stove at home before he and his three colleagues arrived. Memet also installed new electric sockets and even prepared fresh rolls of toilet paper outside his toilet for the four government employees. "Many villagers cleaned their houses, prepared quilts and cooked food after they heard about the visit of their 'relatives," read the diary. An official surnamed Niu in Urumqi who was paired with a Uyghur family in a village in Yengisar county, Kashgar, at the end of 2016, told the Global Times that local villagers welcomed the stay of those "relatives," as they have been in contact for a year. Some villagers have known their "relatives" since 2014, when Xinjiang first allocated cadres to work in villages. Their "relatives" could also help villagers solve difficulties, such as finding jobs for their family members. Niu refuted Western media reports that villagers objected to the visits of government staff, saying the stay was "a family visit." "I visit my 'relatives' every two months since 2016, inviting them for meals, having casual talks and asking about their difficulties in life and offering suggestions," Niu said. "Sometimes, when I left for Urumqi, my relatives would shed tears and said that they did not want me to leave," Niu said. During the unity week, each government employee paid 50 yuan ($7.7) per day to the "foster" family, and they prepared their luggage themselves and respected local Uyghur villagers' tradition, said Niu, whose wife, also a Xinjiang government employee, participated in the unity week in a village in Kuche county, Aksu. Villagers as "relatives" of government staff were selected from a list of poor families of each village, as one important purpose of the activity is to help local residents stave off poverty in line with China's goal to lift all of its poor out of poverty by 2020, according to Niu. Yengisar county, where Niu's relatives live, is a national level poverty-stricken county; most are Uyghur people. According to stories revealed in Xinjiang media, during the week-long stays, government employees helped their "relatives" with farm work such as peeling corn and herding sheep, helped children with their homework, offered young adults job opportunities, donated clothes and money and took sick family members to hospitals. 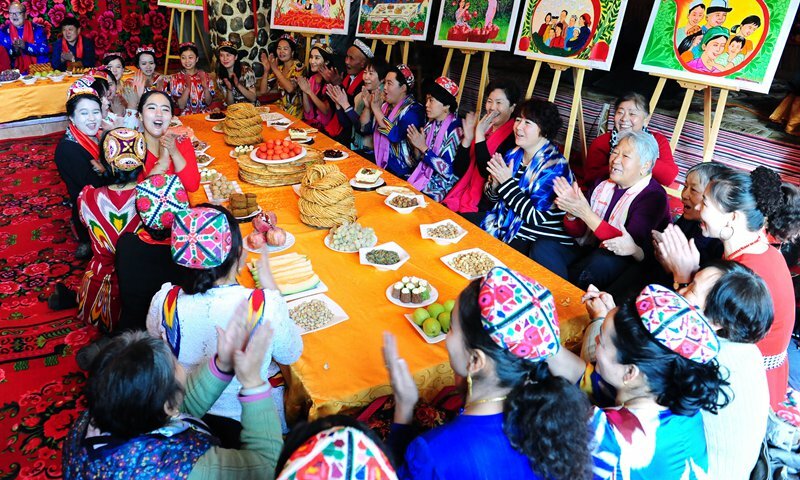 Employees from the cyberspace administration of Xinjiang went to a village in Xinhe county, Aksu, to spend their unity week organized Party meetings at villagers' homes. In one such meeting, about 10 Uyghur villagers and their "relatives" were seated around a dinner table served with fruits and Xinjiang cuisine. Cadres shared stories of an old soldier during the Sino-India border war and a Uyghur farmer's life path from poor to rich, according to the WeChat account of the administration. The wife of the Uyghur villager was on the verge of tears as she listened to those stories. She said that morals from those stories can lead them to a promising path out of poverty. In the end, all the members of the meeting took an oath in front of a Party flag. Aside from Party meetings, Niu said that they also explain national polices plainly to villagers in the Uyghur language or translated into the language, discuss the 19th CPC National Congress and let villagers realize that the good changes in their lives were brought about by the Party and the government, and that they should work hard, listen to and follow the Party. "Having government staff eat, live and work together with the grassroots people is not only targeted at Xinjiang, it is a tradition of the CPC originating even before the founding of the country," Su Wei, a professor at the Party School of the CPC Chongqing Municipal Committee, told the Global Times. Meanwhile, promoting the spirit of 19th CPC National Congress among Uyghur villagers also conforms to the Party Central Committee's demand to promote the spirit in enterprises, villages, institutions, campus, communities and military camps, according to Su. At night, government employees from the cyberspace administration organized Chinese culture classes for Uyghur children. At first there were about 20 children attending the class; soon over 100 children and their parents were attracted to the lecturers about Confucian classics and other Chinese literature, according to the WeChat of the administration. However, some Western media viewed theses activities as a "sabotage" of ethnic unity by monitoring ethnic minorities. Xiong Kunxin, a professor of ethnic studies at Beijing's Minzu University of China, slammed such reports, saying it was just made by some people who have ulterior motives deliberately distorting facts. Maintaining close ties with the masses is an important advantage of the CPC, and it has more significant meaning in Xinjiang, as staying idle not only harms ties between the Party and the masses but also undermines ethnic unity, Su said. "The only difficulty of our work is that we cannot smoothly talk to our 'relatives' due to language barriers, and we often need a Uyghur colleague for translation," Niu said. Some Xinjiang cadres who paid for their train tickets, meals and gifts themselves each time they visited their "relatives" suggested that the government cover the expenses in order to reduce their burdens, according to Xiong who has several students working for Xinjiang government organs. Although the ethnic unity campaign was conducted across Xinjiang, it mainly targeted the southern regions of Xinjiang which are comparatively poorer, more outlying and under a higher threat from the three evil forces, Niu said. During their unity activities, Niu and his colleagues would often conduct ideological guidance to those villagers by talking about previous cases of criminals charged with supporting and promoting terrorism. He encouraged them to tip off local police for possible terrorist activities. "Local villagers trusted us through a series of unity activities and they have actively tipped off police over the past two years. Their actions reflected that they have truly realized the harm of the three evil forces," Niu said. 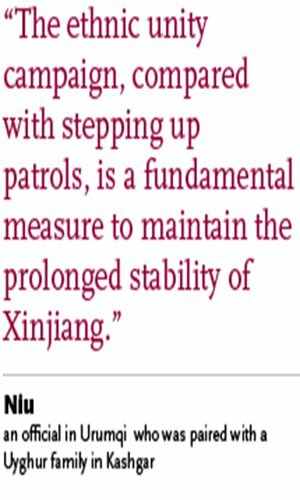 Experts believe the Xinjiang government has increasingly paid attention to the soft approach for maintaining stability in recent years, such as the ongoing ethnic unity campaign, which works better than traditionally tough security measures. "The ethnic unity campaign, compared with stepping up patrols, is a fundamental measure to maintain the prolonged stability of Xinjiang," Niu said. Another soft approach the local government took last year was to encourage Xinjiang media to publish comments written by local government officials to openly fight against the three evil forces as well as two-faced cadres (local officials who support, participate in or secretly organize extremist activities). Meanwhile Xinjiang has also strengthened its security. Cities in Xinjiang have been posting online advertisements throughout China since the end of 2017 in a bid to recruit more police officers to ensure regional stability.